Happy Spring! Between gardening, biking, and traveling, April has been a busy month in our household! This month's ethnic recipe brings us to my region of the world: northern New Mexico, where culinary traditions and powerful flavors represent a blend of Hispanic, Native America, and Spanish influences. This unique recipe from the Santa Fe School of Cooking uses dried Ancho chile peppers stuffed with chorizo and refried beans, with a really delicious tomato-oregano sauce. 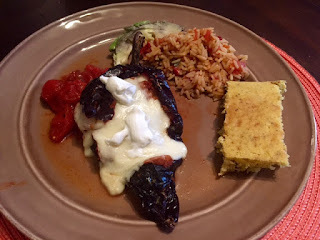 I served it with Spanish rice, green chile corn bread, and fresh avocado. This was definitely the best New Mexican dish I've made at home! Hope you enjoy it as much as we did!